At the meeting chaired by Prime Minister Sher Bahadur Deuba and co-chaired by Education Minister Gopal Man Shrestha, the university approved the master-plan that comprised of four parts: academic, human resources, financial, and infrastructure. “Although the university was established 12 years ago, little initiative was taken to write the master-plan. It is the fruit of our hard work in the past two and a half years that we were able to finalize the master-plan,” said Professor Naresh Man Bajracharya, vice chancellor of the university. Bajracharya headed the master-plan drafting committee. The senate also approved establishment of four new degrees related to Buddhism, including post-graduate diploma in Buddhism and yogic sciences, post-graduate diploma in library information science and archives management of Buddhist collection, certificate in Buddhism and Chinese language, and certificate in Buddhism and Nepalese language. The new degrees have been established to make Buddhist studies even more useful and more accessible to wider population, said Bajracharya. 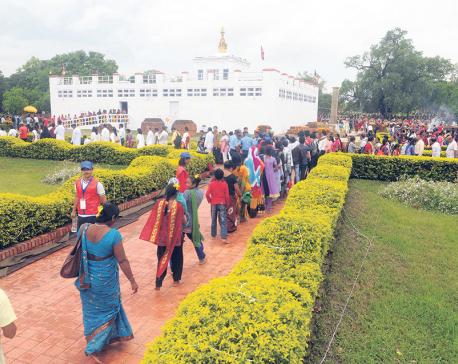 On the occasion, Prime Minister Deuba stressed on the need to make Lumbini an international center of Buddhist studies. The prime minister is the chancellor of the university and the education minister officiates as the pro-chancellor. The senate meets twice every year.